Aromatase Inhibitors are drugs that prevent the formation of estradiol, a female hormone, by interfering with an aromatase enzyme. Aromatase inhibitors are used as a type of hormone therapy for postmenopausal women who have hormone-dependent breast cancer. Epigenetic therapy with histone deacetylase inhibitors is worth pursuing in hormone receptor positive advanced breast cancer, suggests a phase III trial reported today at the ESMO 2018 Congress in Munich. Adjuvant treatment with the bone sparing drug zoledronic acid plus hormonal therapy with the aromatase inhibitor letrozole significantly increases disease-free survival compared to tamoxifen in premenopausal women with hormone receptor positive (HR+) early breast cancer, according to results reported at ESMO 2018 Congress in Munich. The U.S. Food and Drug Administration today approved Kisqali (ribociclib) in combination with an aromatase inhibitor for the treatment of pre/perimenopausal or postmenopausal women with hormone receptor (HR)-positive, human epidermal growth factor receptor 2 (HER2)-negative advanced or metastatic breast cancer, as initial endocrine-based therapy. Professor Jack Cuzick from Queen Mary University of London has received the Cancer Research UK Lifetime Achievement Award for his work on cancer prevention and detection. Astex Pharmaceuticals, a pharmaceutical company dedicated to the discovery and development of novel small molecule therapeutics for oncology and diseases of the central nervous system, announced today that its long-standing pharmaceutical collaborator, Novartis, has received marketing approval in Europe for Kisqali (ribociclib) plus an aromatase inhibitor as a first-line treatment in post-menopausal women with hormone receptor positive, human epidermal growth factor receptor-2 negative (HR+/HER2-) locally advanced or metastatic breast cancer. A new study led by City of Hope researchers has found that regular use of low-dose aspirin (81mg) reduces breast cancer risk in women. Led by Leslie Bernstein, the team found that women who took the low-dose aspirin, also known as “baby” aspirin, at least three times per week had an overall 16% reduced risk of developing breast cancer. The German Institute for Quality and Efficiency in Health Care (IQWiG) investigated whether and what advantages drugs from the drug class of aromatase inhibitors offer compared with other breast cancer treatments or with each other. Among older aromatase inhibitor (AI)-treated patients with breast cancer, current smokers at treatment initiation have an increased risk of breast cancer events and distant metastases, say Swedish researchers. 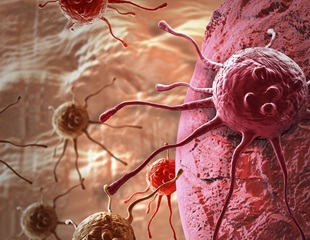 The investigational anticancer therapeutic abemaciclib, which targets CDK4 and CDK6, showed durable clinical activity when given as continuous single-agent therapy to patients with a variety of cancer types, including breast cancer, non-small cell lung cancer (NSCLC), glioblastoma, and melanoma, according to results from a phase I clinical trial.